Paciﬁc Media Centre | articles: COP21: Paris climate talks - COP21, or 'cop out'? COP21: Paris climate talks - COP21, or 'cop out'? PARIS (Think Big/Pacific Media Watch): ANALYSIS: If you worry about climate change, really worry, you are aware of the United Nations-convened COP21 (Council of Parties) negotiations going on for the next week and a half in Paris. That lack of deep and widespread public concern is why the Paris talks will end up being more talk than significant progress. No matter what the countries agree to, either in terms of actual reductions in greenhouse gas emissions or in terms of a legally-binding monitoring process to make sure nations keep their promises, the progress made at these talks will fall far short of what is necessary to forestall serious, even catastrophic harm from climate change. Without deep public concern, the political will is just not there to push governments to do the big things that taming this big threat requires. A lot of polls and surveys have been published to coincide with the COP21 talks. On the central question of how worried people really are, these findings are all, unsurprisingly, pretty bleak. A Globe Scan survey of 21 OECD (wealthier) nations found that only about half of the public thinks climate change is a very serious problem, and those percentages drop to just one third in China and the U.S., the world’s two biggest economies that are doing most of the polluting and have to reduce emissions far more than they have promised. One survey by the Yale Project on Climate Change Communication found that only 4 Americans in ten feel personally threatened by climate change. …most Americans report a general sense that global warming can be harmful to health, but relatively few understand the types of harm it causes or who is most likely to be affected (my emphasis). Perhaps as a result, there is only moderate support for an expanded (government) public health response. A Pew survey found really depressing evidence. 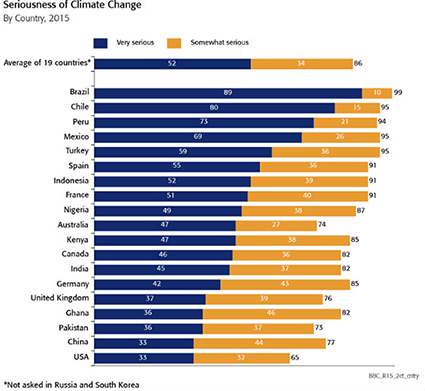 In Europe, Asia, and in the U.S. and China specifically, only roughly one person in four is very concerned that they are personally threatened by climate change. In China, the world’s largest current emitter of greenhouse gasses, that figure is just one person in seven. Climate change doesn’t feel personally threatening, nor immediately threatening, enough to energise strong enough political support for major emissions reductions. Which explains why, as Justin Gillis of the New York Times has reported, the cuts that countries have promised going into the Paris meetings, while greater than previously promised, are inadequate to keep global climate temperature increases to no more than 2 degrees Celsius (3.6 degrees Fahrenheit), a generally recognised threshold beyond which climate change impacts start to get catastrophic. In effect, the countries are vowing to make changes that collectively still fall far short of the necessary goal, much like a patient who, upon hearing from his doctor that he must lose 50 pounds to avoid life-threatening health risks, takes pride in cutting out fries but not cake and ice cream. The pledges countries are making are voluntary, and were established in most nations as a compromise between the desire to be ambitious and the perceived cost and political difficulty of emissions cutbacks. The tough negotiations in Paris aren’t about deeper cuts. They’re really about whether and how to make voluntary promises legally binding, and big emitting nations, like India, are hedging on that. represent a clear and determined down payment on a new era of climate ambition from the global community of nations. And to be fair, hundreds of the world’s largest companies are dramatically reducing their greenhouse gas emissions, because it’s the right long term business strategy, not because consumers are clamoring for such changes. And to be fair, some of the wealthiest people in the world (Bill Gates, Mark Zuckerberg, Jeff Bezos, Jack Ma of Alibaba, Richard Branson) have donated billions of their own dollars to create the Breakthrough Energy Coalition to fund research on new clean energy technologies, like advanced nuclear power generation. Public pressure didn’t prompt that. But the energy sector produces only about a third of the world’s greenhouse gas emissions. Industry, transportation, agriculture, residential, land clearing (rainforest burning), even waste disposal (methane from garbage dumps and sewage treatment)…the list of huge economic sectors also contributing to human-induced climate change is depressingly long, making the challenge of reducing these emissions technologically, economically, and politically difficult. Which will be too late. Short of that level of worry, the promises and concessions likely to come out of Paris, both in terms of actual emissions reductions and in terms of what sorts of internationally legally-binding controls most nations will accept, are likely to give the world only as much as our worries currently demand…which isn’t nearly enough.